Samsung’s new S8 and S8+ surprised us in a way in which we haven’t been surprised in years. We always expect each new generation of phone or computer to improve, to get faster. A decade ago, it was common for each year’s new computers to be twice as fast as the previous year’s. And then the speed increases slowed, and at least on the desktop computer side, almost stopped. With smartphones, we’d come to expect a few percentage points of speed increase. And while these typically minimal speed increases were appreciated, they were often barely detectable in real world use. So when we had our first hands-on with Samsung’s S8 series, the massive, raw, speed increases over the prior models floored us. The expectation was of a smartphone that might be a few percent faster, the reality was a smartphone that feels twice as fast as anything on the market. Speed is where the Galaxy S8 line so strongly differs. While certainly not twice as fast in benchmarks, the butter-like smoothness, low latency, and outright immediacy to every touch makes one realize the liabilities of devices we used to believe were fast enough. Even a few seconds of using the new S8 models sends a singular message, and that message is speed. These phones are so fast, so smooth, they almost feel as though Samsung skipped over 2017 technology and went straight to 2020. The engines behind this speed feat are the Samsung and Qualcomm processors that power the various versions of the S8. Most international markets will receive the Samsung Exynos 8895 processor while the US market will receive the Qualcomm 835. The S8 line will be the first flagship phones to showcase these processors. The versions of these processors powering the S8+ are clocked to run slightly faster than those in its smaller cousin, the S8. This is very likely due to heat dissipation needs. Each of these new processors is built using the smallest feature sizes the market has yet seen. By reducing the feature size to 10 nanometers, greater computational and graphical power can be delivered while keeping battery life similar to the previous generation of processors. The chips powering the Galaxy S8 and S8+ are the first legitimately “desktop quality” processors to be seen in smartphones, and it shows. With the desktop quality processors, comes a feature that has been tried by other makers with middling success, allowing a phone to be the brains of a desktop computing experience. With the DeX dock, either S8 model can run what seemed in our short view to be a quite functional desktop experience. The DeX dock has a unique, fold-up design that allows a phone to be quickly inserted. It does require an actual attachment through the phone’s USB type C port for HDMI and the other posts, unlike a wireless solution shown by Intel a few years ago. 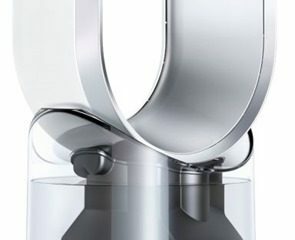 A fan is present in the rear of the DeX unit to disperse any heat created by the phone while operating as a desktop computer. The rear of the DeX dock features a bevy of ports, including HDMI, Ethernet, and a pair of USB 2.0 ports. 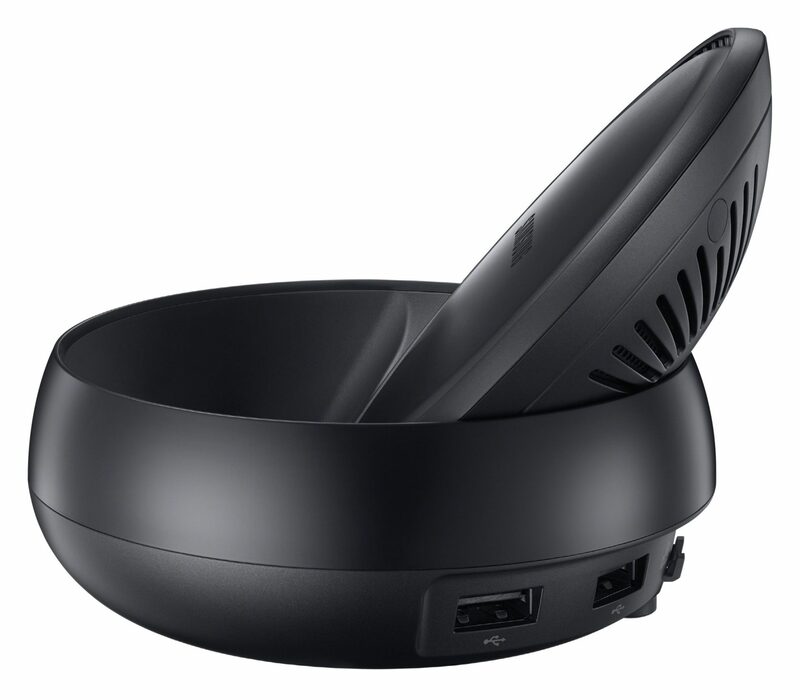 The DeX dock is designed to be attached to a monitor and can work with wired or wireless keyboards and mice. 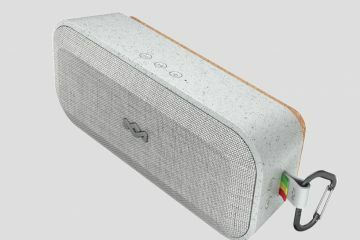 We were told there will be two versions of the DeX dock, one without fast charging, and another including adaptive fast charging for a $10 premium. We’d find it difficult to recommend the cheaper DeX dock, as the fast charging version is barely more expensive. When connected to Dex, the phone drives display resolutions up to 4k at 30fps. 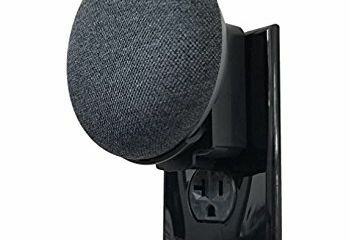 Audio is passed through on the HDMI signal, so if there are speakers within or attached to a monitor, sound will be present. We were told HDMI audio could also be split out to external speakers with an HDMI audio splitter cable. DeX is Android on the desktop. Most newer Android apps that fully support Android 7/Nougat will run on Dex, though only a subset of Android apps permit fully customizable resizing of their windows. Microsoft’s suite of Android apps received upgrades for better functionality with Dex, as did certain Adobe Android apps. There is also a full featured remote desktop app that was displayed running a Windows client. 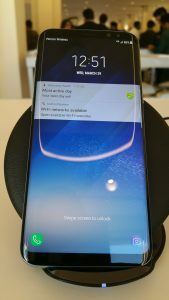 Our experience with DeX on the S8+ left us quite impressed. Popping a phone into the dock resulted in a full, live desktop in about 10 seconds. We loaded up an extremely heavyweight 3D site and the S8+ on DeX handled it equally well to an Intel powered system with a high end graphics card. That’s not to say the S8 series is the equal to a top end desktop processor with discrete GPU, it clearly is not. Still, the S8 series with DeX is certainly not a system that should be seen as only being able to handle lightweight desktop tasks. The S8 with DeX seems more than able to handle work that would have been considered heavyweight desktop tasks only a few years ago. We can certainly see hooking DeX up to a living room TV, Bluetooth keyboard and mouse, and using it as an impromptu computer to finish work tasks once at home. This could be especially effective for those of us who primarily use cloud based work solutions like Microsoft Office 365 or Google Docs. The biggest downside we found with DeX was its inability to retain open items on a desktop when the phone was unplugged, then re-plugged into the dock. When the phone is removed from the Dex dock, all work in progress is saved, it’s only the placement of the individual windows that isn’t retained. 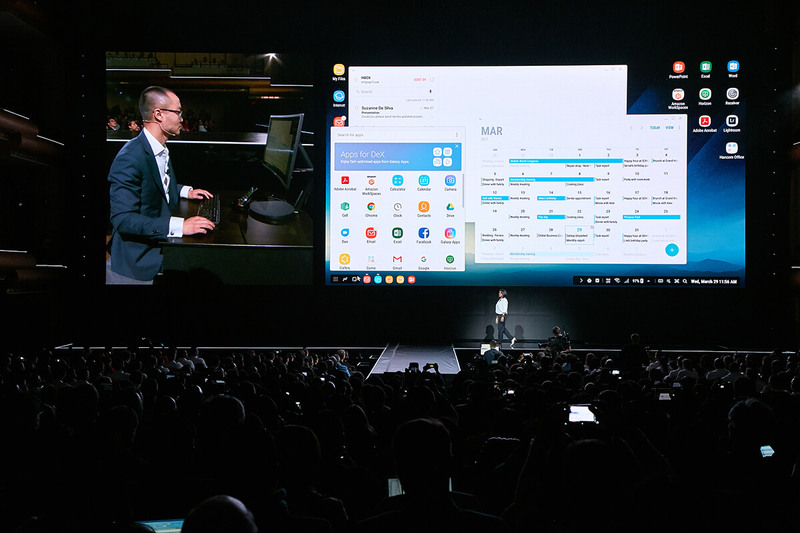 Samsung said they are still working on DeX features, and we hope workspace windows persistence will be one. Permanent directories of apps can be created, and icon locations can be saved. We also found it surprising that DeX cannot use Android widgets on it’s screen. Hopefully this will come in a future update. Given its desktop quality processor, and the enormous library of Android apps, Microsoft Apps, and Adobe Apps, the S8 could be the phone that finally manages to make the phone/desktop experience work. The only questions left in our mind are will Samsung continue to upgrade the DeX desktop to including missing features and most importantly — what happens when a phone call comes in while you’re in desktop mode? The Samsung Galaxy S8 series are possibly the most beautiful smartphones ever. Years ago when Samsung introduced the Galaxy Note 2 they made frequent references to the beauty of nature and the smoothness of stones shaped in rivers. At this event they made similar references. 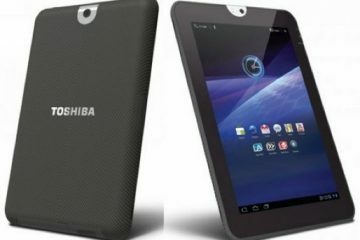 The devices are smooth, beautiful to look at, and comfortable to use and hold. The glass front and back merge almost seamlessly with the metal sides. If you are holding the black model it’s almost impossible to tell where the glass ends and the metal begins. These are truly works of art on par with other great industrial design. 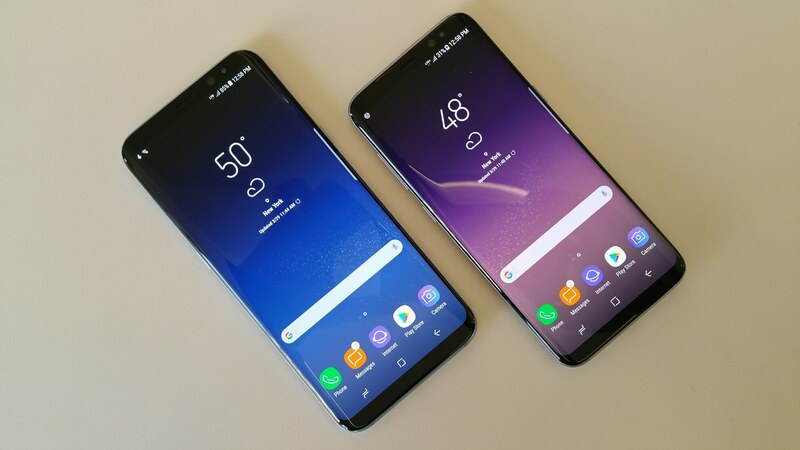 Due to the curved edges and the increased vertical resolution these phones are both slender and tall. Because there are nearly no side bezels, and minimal top and bottom bezels, the phones are far smaller than any other phone with similar screen sizes. Apple’s iPhones look monstrous and outdated in comparison. The old Google Nexus 6p is ungainly and clumsy when held next to these. 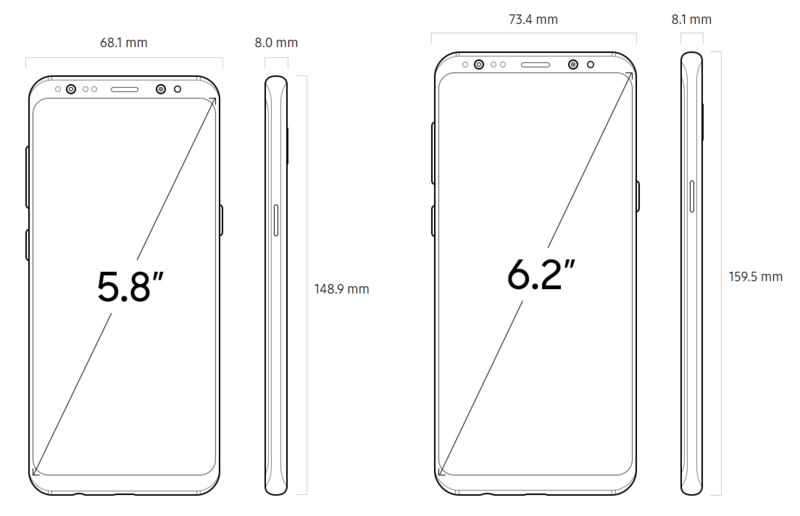 Even Google’s current Nexus 6p, with a 5.7” screen, is larger than the Galaxy S8+. The only negative is simply that glass is fragile. There’s a lot of glass here. Fortunately Samsung does offer many case options that are equally beautiful and can protect these phones. Samsung had long been the major Android holdout in keeping a physical home button front and center at the bottom of the screen. 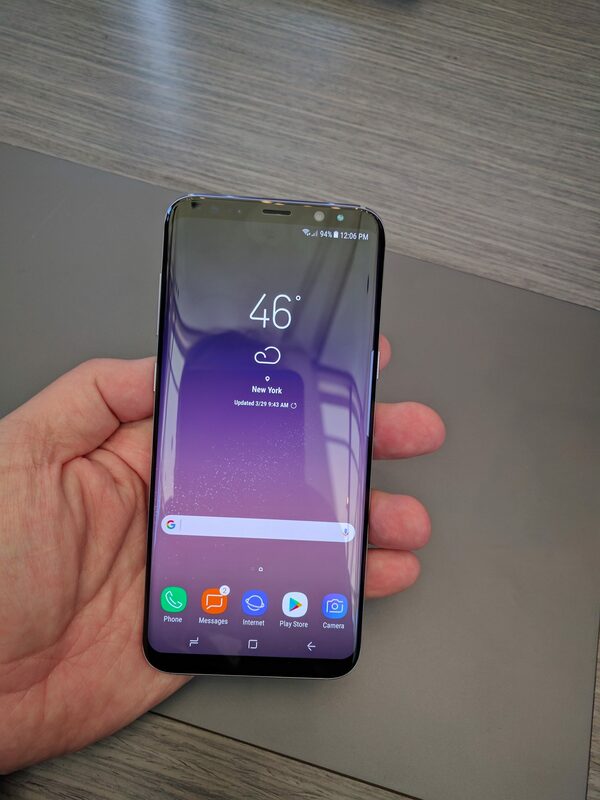 From appearances, Samsung would finally seem to have followed the pack in adopting a “soft” home button, no longer physical, but displayed as an on-screen graphic. While the phone seems to function much like other devices with soft home buttons, Samsung has reportedly placed a pressure sensor beneath the home row at the bottom of the screen, allowing a press there to over-ride any application. This is an important differentiator, as it should prevent any app from taking over the phone. When an S8 or S8+ user taps the spot where the home button now resides, it should respond every bit the same as if they’d tapped a physical home button. 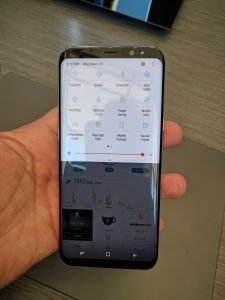 While the soft buttons default to the Samsung standard of the back button to the right of home, and recents button to the left, reportedly these can be swapped in settings to the more-standard configuration found on most other Android devices. Who wants another voice assistant? Samsung does, and after our short experience with Bixby, you may as well. Bixby is a voice assistant, much like Alexa, Siri and Google Assistant. Unlike Google Assistant, Bixby seems focused on providing services directly related to the device on which the service is running. Samsung representatives showed us Bixby controlling the phone’s hardware directly. The increasing number of settings within modern phones make it difficult for users to change, or even find the setting they’re looking for. One of Samsung’s plans with Bixby is to allow the finding and setting of any and all phone settings through an intelligent voice interface. In fact, Samsung claims that any hardware setting within the phone should eventually be controllable through Bixby. Samsung demonstrated an S8 taking pictures by voice command, but it appeared that much of Bixby’s magic is being held off until the April 21st release date. Samsung also plans for Bixby to control its Smart Things internet-of-things hub and other Samsung smart products. Bixby does have some of the tricks of Google Assistant. While it wasn’t ready at today’s preview, Bixby should provide context aware information when browsing Google Maps, Google Music, and will have some form of integration with Google translate. This suggests a level of voice-assistant cooperation between Google and Samsung, despite seemingly direct competition between the rival voice products. Eventually, we suspect Samsung will want Bixby to evolve into a full-fledged Google Assistant level of intelligent voice product. Until then, Bixby will provide a useful feature set that Google Assistant does not, controlling the phone’s hardware itself. Interestingly, holding down the home button on the S8 launches a fully functional Google Assistant. Perhaps the most interesting feature of Bixby was one Samsung was not ready to show. At the press reveal, there was no way to activate Bixby through voice. 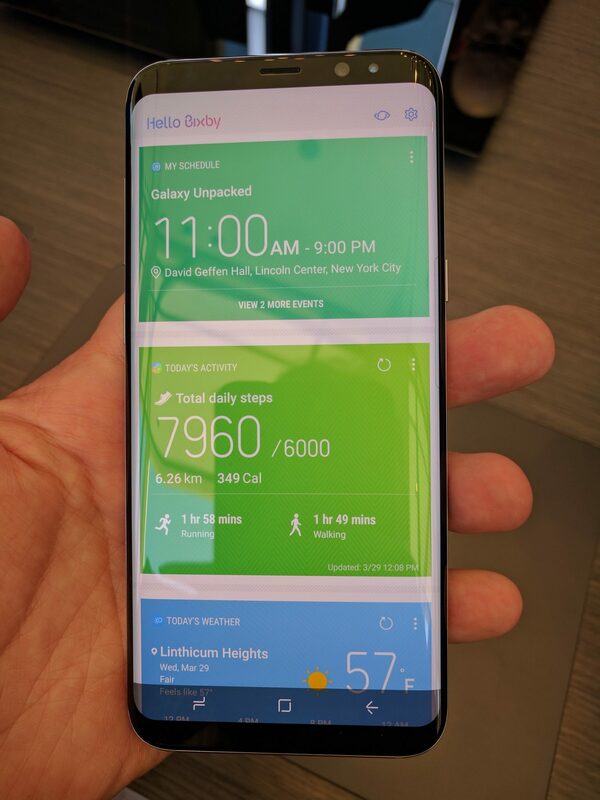 Bixby could only be activated through a new, dedicated Bixby button on the side of the phone or through the phone’s interface. There was no way to wake Bixby by saying something to the effect of “Hello Bixby”. 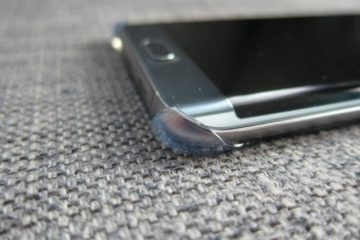 Samsung had no comment when asked about this curious omission, leading us to wonder if the feature wasn’t quite ready. Though some speculated that a public showing of “Hello Bixby” may not have worked well in the cacophony of the Lincoln Center’s echoing halls. Either way, we fully expect a voice awakened Bixby is not far off. As with most new generations of phones, hardware throughout has been upgraded. The minimum flash memory storage has been upped to a welcomed 64GB. All S8 devices will feature 4GB of RAM. A micro-SD expansion card slot is compatible with cards up to 256GB. That limitation only likely exists because those are the largest cards currently on the market. We strongly suspect the S8 class to be capable of supporting micro-SD cards up to 2TB, when they become available. 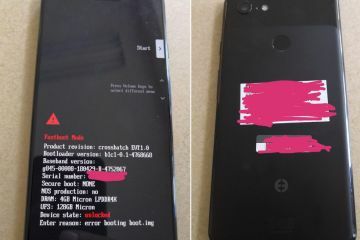 Due to the front display being nearly all screen, the fingerprint sensor has necessarily been moved to the back of the unit. The sensor is next to the camera lens, which may cause some confusion and blurred shots, but we feel this will probably not be an issue given the other, better methods of biometrically unlocking the S8 series. In addition to fingerprint unlock, the S8 features what seemed to us were top class facial recognition and retinal sensors. 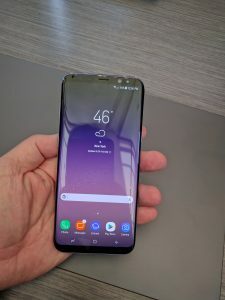 While we were not able to record our own faces or eyes, the Samsung representatives repeatedly and quickly unlocked devices with this new-to-Samsung technology. Samsung’s facial recognition seems to work every bit as well as the much lauded facial recognition in Windows 10, but we’ll update with our testing data once we receive our own devices. The front (selfie) camera on the S8 has been greatly improved to an auto-focusing 8 giga-pixel sensor with the same f1.7 exposure that the rear camera enjoys, while the rear camera sensor remains the same as the already amazing sensor in the Galaxy S7. We were extremely impressed with the performance of the camera on these previous Galaxy models and expect somewhat better performance with the S8. 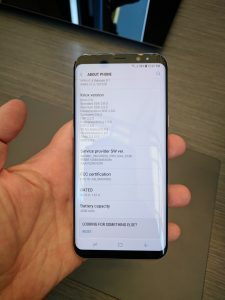 This is because the additional computational power of the S8 has allowed for more refined controls. The demo shots we took with the S8 and S8+ were of the quality we have come to expect from top line smartphones. While we were unable to test the low-light ability, as the S8 series is using the same rear sensor as the prior Galaxy, we are confident the low light ability of the units will be excellent. While not an upgrade – it’s worth noting that Samsung chose to keep the standard 3.5mm headphone jack which is enormously welcome to audiophiles not wanting to be limited a a single vendor’s supplies. That being said, Samsung is including Harmon AKG earphones with every phone that give you a premium sound quality! After the recent unpleasantness of the Note battery issues, Samsung met the troubles head on with new, industry leading safety standards. The S8 series feature the same battery storage capacity as the prior generation. This gives the S8+ a 3500 mAh battery, and the smaller screened S8 a 3000 mAh battery. Many, if not most US retailers are including a free Gear VR and the new handheld motion controller with every S8 or S8+ purchase. We tried on the new Gear VR and found it to be quite similar to the most recent units. The real difference with this new Gear VR is the handheld motion controller. It provides the ability to reach in to the Gear VR’s 3D space, selecting and moving through the environment. This new controller is much like an air mouse or a far more accurate version of a Wii Mote game controller. A 3D aware motion controller has been a real missing link of Samsung’s VR offering, and this is a welcomed addition. Samsung would not confirm whether the new motion controller would function with prior Gear VR units, but given that it’s a Bluetooth device, and that Samsung seems ready to sell it separately, there seems little reason it shouldn’t be able to function with older Gear VR units and phones. Samsung has created something amazing here. For years we’ve expected them to lead the smartphone market in innovative new features and they’ve been refining their software with their partners – even to the point of being willing to abandon one approach in favor of a better approach with a partner. Astonishingly enough they’ve partnered with major players to produce what might be the perfect smartphone for 2017. 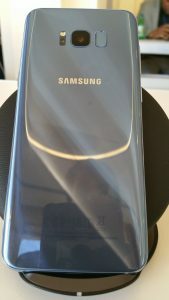 A device that includes Google features along with Samsung features. Following the Unpacked event Microsoft also confirmed their partnership where they will be selling the S8/S8+ bundled with Microsoft software including Cortana. Bringing three smart assistants to this flagship device! The phone has everything that you could want. 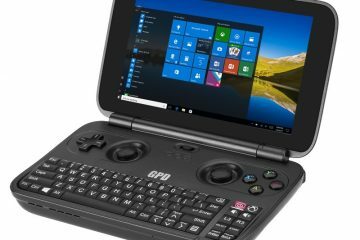 The mobile traveler will appreciate the portable desktop. Business users will appreciate the security features that no other phone can match. All users will love the beautiful design and feel of the phone in their hand. The price is low for a phone of such power. Only $850 for the S8+ and merely $750 for the S8. Colors will include Midnight Black, Orchid Gray, Arctic Silver, Coral Blue and Maple Gold. Your carrier may not offer all colors however. It’s only March but based on what we know of other manufacturers, the S8 series are the leading flagship phones to beat this year. It’s so far ahead of everything else we can’t see anyone catching up to them some time. Look for it April 21st at all cellular carriers, Target, Best Buy, Walmart, Samsung.com and Microsoft.